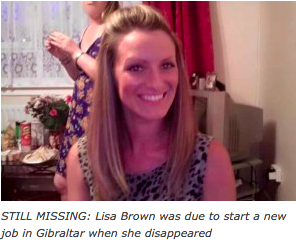 THE family of missing British expat Lisa Brown have offered a €114,000 reward for information in a desperate plea to find the truth. Scot Lisa, 31, went missing from her home in Guadiaro, Cadiz on November 4 2015. The appeal is supported by the Foreign and Commonwealth Office and Spanish authorities and is backed up by a reward of up to £100,000 (€114,000) from the family, which is supported by UK charity Crimestoppers. Craig Douglas, Brown’s brother, said their family believes that there is a ‘wall of silence’ among the English-speaking community in southern Spain over his sister’s disappearance. “We are sure that people know what happened and ask them to think of a little boy who asks every night when his Mummy is coming home. We also hope that the reward might persuade people to tell us what happened,” Craig said in a press conference, attended by the Olive Press this morning. British Ambassador Simon Manley said he hoped the launch of this appeal is effective as he offered his support at the meeting. “Citizen collaboration is essential in these kind of cases,” the Ambassador said. Spain or via the web form at https://crimestoppers-uk.org/give-information/give-information-online. The reward will be paid out to any providing substantial information leading to the arrest and conviction of those responsible or results in identifying the whereabouts of the body. The reward will be valid for six months dating from March 23. The appeal is supported by the Foreign and Commonwealth Office and Spanish authorities.